A common trait that you’ll find among many online business owners is that they’re never quite satisfied with the status quo, no matter what level of success they’ve achieved. Whether it’s called ambition or the entrepreneurial spirit, these business owners are constantly looking for ways to take their businesses to the next level. But doing so is dependent on whether or not their business model can scale. The good news is that scaling an online business is much easier than trying to grow a more traditional brick-and-mortar operation; you don’t need to scout additional storefronts or worry about finding more physical space. The business is mostly virtual, so there is, quite literally, an infinite level of potential. So what are ways to achieve this kind of growth? When many entrepreneurs first start out, they only focus their efforts on one geographic region for the sake of simplicity. Some may only sell their products in the country they are living so they don’t have to deal with accepting different currencies, or having to figure out how to handle shipping and taxes. Selling to the global market is actually a lot easier than you might think when you leverage e-commerce platforms. Certain platforms allows your store to display in almost any language and accept payments in almost every currency. Your online store can integrate with PayPal, Stripe, and other gateways, with no transaction fees. You can ship internationally through integrations with many providers around the world, and the built-in calculator helps you make sure your pricing structures take territory-specific taxes and shipping fees into account. You can scale your production and you can scale your campaigns, but the one thing that you cannot scale is your time. No matter how you slice it, there are only 24 hours in a day, and only seven days in a week. There’s no sense in wasting your time doing tasks that can be done automatically. Utilize tools like Hootsuite and Buffer to automate much of your social media management. The RSS feed on your blog can be automatically syndicated to Facebook and Twitter with ease, and similar tools exist to invoice reminders to your customers, for example. Look at where you are wasting time, and then figure out how an automated tool can give you more time that you can devote to growing your business instead. When you first start a blog, chances are you’ll be the only one doing the writing. And that’s fine in the beginning when you’re working to establish your brand or to solidify your reputation as an expert in your niche or industry. But as time goes on, you may want to ramp up your content production, and won’t be able to because you simply don’t have the time. This is when you should think about outsourcing. Marketplaces like Freelancer.com and Fiverr are accessible and convenient, but they may not provide you with the long-term solution that you really need. Take the time to seek out people who you are eager to see their writing on your site for years to come. Good news! Your online business is growing at a rapid rate. Bad news! Your hosting plan can no longer handle the kind of bandwidth and control that you need to keep moving forward. As affordable and as easy shared hosting plans may be, they may not be adequate as your needs continue to grow and your business continues to scale. If you don’t feel like you’re quite ready to invest in dedicated hosting, but you want to have a greater sense of control, then VPS (virtual private server) web hosting could be a great step up. To scale your online business, you will need to explore new markets and reach out to new people who can potentially become new readers, subscribers, and customers. There are many ways you can do this, including writing guest posts and sending out press releases. One service that you might also consider is Help a Reporter Out, also known in many circles simply as HARO. Over 50,000 journalists and bloggers are constantly looking for expert sources for their varied content. When you add yourself to the HARO database, you may have writers reaching out to you for your comment or opinion. This could land you invaluable media coverage that you wouldn’t have otherwise been able to get. 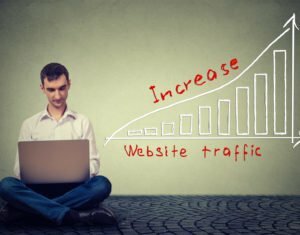 How you plan to scale your online business will obviously depend on the current status of your business. Maybe you’ve already gotten yourself a strong team of professionals on your side: content creators, a marketing team, a production team, someone handling logistics, and so on. A big problem that you may face is with so many moving parts it can be difficult to identify the inefficiencies in the system. The pace at which your business can operate will be dictated by the slowest “cog” in the machine. Some solutions use what is known as a Kanban board. This workflow visualization technique aims to progress tasks from left to right, limiting the number of items that can exist in a column. When you see things start to pile up, you’ll know where things are moving at their slowest. The Pareto principle states that 80% of output is generated by 20% of input. This is definitely true when it comes to business, and may mean that in order for your business to grow, you may have to make some cuts. Let’s say you have 10 products that you sell through your online store. A couple of them may be real superstars, bringing in the majority of your revenue. But at some point, you’ll need to take a look at those remaining eight items and get rid of the underperformers. Doing this will free up resources so you can either focus more of your marketing efforts on the two superstar products, or develop potentially awesome replacements that will hopefully perform better. And continue to focus on what is working and discard what isn’t—remember, this cycle never ends and it’s a mindset you’ll need to reapply over and over again. I just wanted to write you this very small observation in order to thank about what you have discussed in this article. Everyone loves what you guys tend to be up too. This type of clever work and coverage!Keep up the great works guys I’ve incorporated you guys to my blogroll.